PLUS! 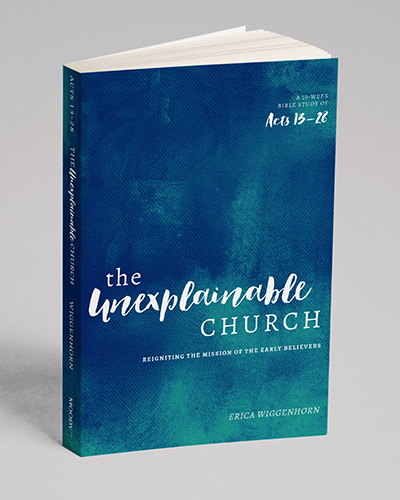 Check out The Unexplainable Church DVD for even more great teaching from Erica Wiggenhorn. It’s the perfect resource for your small group. I just finished reading Erica’s book, The Unexplainable Church. I feel convicted to finish the race and write my own “Acts 29” story. Erica presented God’s Word as well as the history and facts behind the story of Paul’s “Rome or Bust” journey in such a way that I had several “Aha moments.” This is a must read for anyone wanting to learn Paul’s model of obedience, perseverance, and joy in the journey God has given each of us. Erica Wiggenhorn’s first Bible study, An Unexplainable Life, is by far my favorite Bible study. It truly did change my life and develop within me a desire to know the Word better and to live unexplainable lives like those we see in the first chapters of Acts as the church began it’s initial expansion. The Unexplainable Church picks up right where An Unexplainable Life left off, covering Acts chapters 13-28 in a 10-week study that can be done alone or in a small group. Complete the form below to download the companion Leader's Guide for The Unexplainable Church.